PRODUCTS: Remington is voluntarily recalling Remington Model 887™ shotguns manufactured from December 1, 2013 to November 24, 2014. REMEDY/ACTION TO BE TAKEN: STOP USING YOUR SHOTGUN. Any unintended discharge has the potential to cause injury or death.Immediately cease use of recalled shotguns and return them to Remington free of charge. Shotguns will be inspected, repaired, tested, and returned as soon as possible, at no cost to you. DO NOT attempt to diagnose or repair recalled shotguns yourself. For your safety, STOP USING YOUR SHOTGUN and immediately contact Remington. VERIFICATION OF CORRECTIVE ACTION: Upon repair of your shotgun, you will note a punch mark on the bolt (see photo below). This mark confirms your shotgun has been inspected and repaired by Remington under the recall program. Remington has also corrected the manufacturing process to eliminate this potential firing pin problem in shotguns manufactured after November 24, 2014. 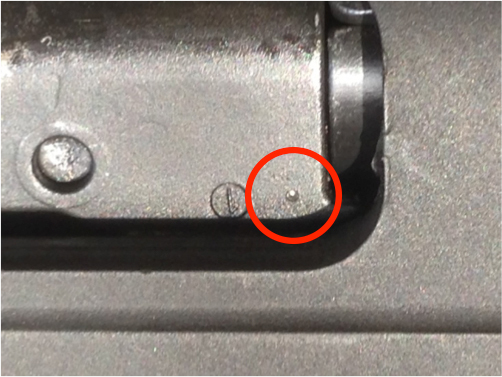 Shotguns manufactured after November 24, 2014 will also have a punch mark on the bolt. Even after your shotgun has been inspected and repaired under this recall program, always follow the Ten Commandments of Firearm safety, printed below, whenever you handle any firearm. Don’t rely on your gun’s safety. If your gun fails to fire when the trigger is pulled, handle with care. Remington is deeply sorry for this inconvenience, but we believe in safety first. It is imperative that Model 887™ shotguns subject to this recall are not used until they have been inspected and repaired by Remington.